No man? No woman? You BE the person! Hubby and I were having a conversation that turned silly. He was describing those round black things in the ground in the middle of the road. 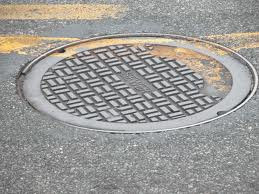 I said, "oh, you mean a manhole cover?" He said, "no, that's a person-hole cover to be politically correct"
Well you can imagine the hilarity that ensued from that point forward. We then proceeded to make a list of all the words, phrases, names, and expressions that we could think of that contained either the word "man" or "woman" and replace it with the word "person." OF COURSE, this exercise is very SILLY and is only meant to have fun and engage with our "inner child." Who's the MAN! Who's the PERSON! You BE the MAN! You BE the PERSON!! alderman, assemblyman, backwoodsman, bellman, business(wo)man etc. Last, but not least is for those Star Trek fans!! Can you think of any words or phrases that we missed?